The turtle dove was once a central part of the British countryside yet it is scarcely found nowadays. I’ve never heard a turtle dove. In fact, I’ve only ever seen one in flight and that was a few years back. It saddens me that this beautiful species could vanish completely from the British countryside. Turtle doves have featured in artwork since the 13th century. A symbol of true love, its call was celebrated in the bible. As a symbol of hope and peace, turtle doves were referred to in twelfth century writings. From a historical piece to modern street art: Artist ATM paints birds threatened with extinction as murals on walls across London to Bristol, Poland and Norway, and has depicted the turtle dove in his work. I am using my art and creativity to help generate awareness around nature conservation and threatened species. 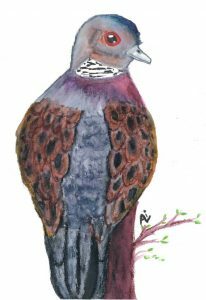 Ali Laura Artistry – Cards for Conservation, where my artwork is printed as a variety of cards donating 10% from each sale to help a threatened species or cause close to my heart, the first being Operation Turtle Dove.